There are certain brands that exist somewhere in the hi‑fi firmament, visible to all but attainable by very, very few. These objects of desire, so often at the centre of vociferous debate, are (seemingly inevitably) loved by some and loathed by others. But most such arguments are ultimately both spurious and pointless, as the protagonists lack both the funds and the hands‑on experience to reach conclusions that matter. It’s a little like motorsport enthusiasts discussing whether they’d rather have Nico Rosberg or Daniel Ricciardo in their Formula 1 team. Unless one of those motorsport fans is a billionaire wanting to be a millionaire, it’s idle dreaming. One of the first names on the Audio Unobtainables dream team sheet would be Zanden. With products that regularly feature on audiophile’s “what if” wish lists – and with prices to match – the brand qualifies on all counts. The company’s most revered product is probably the Model 1200 Mk III phono‑stage, a two‑box unit that offers two inputs, switchable gain and five different replay EQ options – at a price that’s five‑pence short of £24K! Then there’s the (slightly) more affordable Model 1300: same facilities, single‑box, and a mere £13.5K – not exactly pocket money. Which brings us to the Model 120, a product that looks every inch a Zanden. It’s a Zanden thanks to that slim, square footprint, chromed chassis, and external power supply. Also, the four controls equally spaced across the frosted acrylic front‑panel and, perhaps more than anything else, those five different replay EQs make it unmistakably a Zanden product; one of a rare breed of products hailing from the gifted pen of Yamada‑san. Yet the Model 120 tips the financial scales at a “mere” £7,495; not exactly chicken feed, but positively cheap by Zanden standards. This is where cynicism tends to kick in, with the obvious question being, what’s been left out? If the boxes look pretty much the same and all the facilities and functions are in place, what corners have been cut and where? If the Model 120 really is going to be the Volks‑Zanden to the 1200’s Mercedes SLS or the 1300’s AMG GT, then it needs to do more than just look the part – it needs to deliver Zanden performance too. Look a little closer and what you discover is that this is actually a typically thoughtful and carefully considered design that’s cut its cloth with considerable skill in order to also cut its costs. The first indicator comes in the shape of the compact external supply. It’s nicely finished, but with its through‑box format, it’s clearly designed to be tucked away out of sight – unlike the power supplies on Zanden’s more ambitious products. Given that the Model 1300 is a one‑box unit, you might well wonder why the 120 has an external supply in the first place? Look under the lid and you’ll find your answer. Unlike its bigger brothers, the 120 is an entirely solid‑state design, which necessites a separate PSU to remove stray electro‑magnetic fields. Going valve-free is not the show‑stopper you might think, thanks to the brand’s extensive experience with solid‑state and hybrid circuitry. In fact, the retention of Zanden’s LCR topology is arguably more critical. Explaining ‘LCR’ can get a little confusing; capacitance (‘C’) and resistance (‘R’) are obvious, but ‘L’ is short for ‘inductance’, in honour of the electrical pioneer Heinrich Lenz. You can’t use ‘I’ here, because that is already used to denote ‘current’. Incidentally, inductance (L) is measured in H (henry), while current (I) is measured in A (ampere) – put them together and you can spell ‘hail’! The Model 120 is equipped with two, independently switchable inputs, one single‑ended (RCA) and one balanced (XLR), although users can order it with two single‑ended inputs at no extra cost. Outputs are single‑ended only. The front panel is an object lesson in minimalism. Working from left to right, there’s a push button for on /off, followed by a four position rotary control that combines input selection and cartridge load. This matches the ‘high’ or ‘low’ impedance requirements of the cartridge, each setting having its own pair of Jensen step-up transformers – ‘low’ impedance has 73dB of gain, and ‘high’ 63dB. The next rotary control selects the five EQ curves and the final push button switches absolute phase. All the selections are indicated by small, traffic light LEDs. There really should be no excuse for leaving the unit set to the wrong phase, EQ, or load, while for me, the acrylic front panel, matt controls and sharp LEDs make this the best looking of a notably attractive line. With all the functional versatility that makes the more expensive Zanden phono‑stages so capable and appealing, the Model 120 has all the physical attributes to become a firm favourite – especially given its more approachable price. Time then, to talk musical performance and define where the 120 sits relative to its more illustrious brethren. If the 1300 trades away some of the 1200’s remarkable tonality and dimensionality, harmonic and acoustic coherence in return for a crisper, more energetic sound with more obvious dynamic authority, it’s tempting to assume that the 120 extends that continuum. In fact, it sits rather neatly between those two schools. It is softer and less emphatic than the 1300, without the remarkable sense of shape and space that comes from the flagship. In the context of products with five‑figure price‑tags, that makes it neither fish nor fowl: less precise than some, less warm than others. What that means is that you don’t get a Model 1300 for around half the price – which is exactly why the 1300 is in the Zanden family! Play the Zanden Model 120 in systems constructed from among its price peers, and you start to realise just what a cannily balanced product it is. 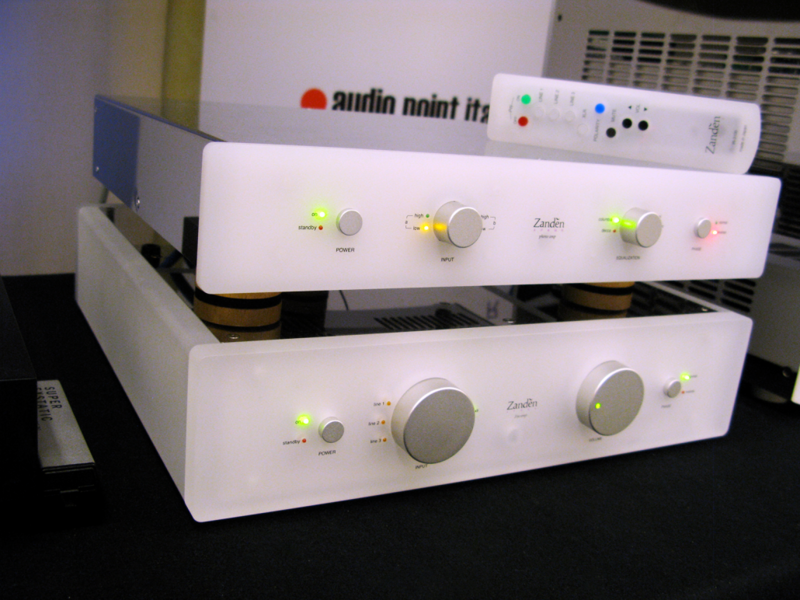 It was particularly impressive paired with the Rowland Capri S2 pre and Model 125 power amplifiers. Here, the 120’s subtle softening took the edge off the Rowland’s laser‑cut resolution and transparency, while its sense of temporal integrity and rhythmic coherence gave music a real sense of life, bounce, and flow; a musical dovetail that immediately elevated all the products involved. The Zanden is also one of the few units that can sit comfortably beside the flawlessly finished Rowlands, and the musical partnership cuts both ways; the amplifiers’ clarity and resolution clearly showing the benefits of the 120’s various replay curves. With so many midrange amplifiers tending towards detail, focus, dynamics, and slam at the expense of more subtle aspects of rhythmic expression that underpin vinyl’s musical appeal, the Zanden does a beautifully judged job of nudging them back into line. It’s the musical coherence the Model 120 brings to record replay that should guarantee it a place on your list if you are shopping in this price range. While other phono‑stages might deliver more resolution or a greater sense of substance, few if any, at or near this price match the Zanden’s overall sense of musical shape and phrasing. Nor do they offer its switchable EQ. By now, you’ll either know which side of this particular fence you sit, or the Zanden will allow you to discover, but with the right record the musical impact is far from subtle – and the other thing you might discover is just how many records that is. By combining features and topology normally associated with far more costly products with a carefully executed solid‑state circuit and beautiful case work, the Zanden Model 120 succeeds in injecting a serious slice of genuine high‑end performance into the sort of systems more of us can actually afford. It preserves the timing, flow and phrasing, emotional and expressive qualities, the colour and weight that explain top‑end vinyl replay’s benchmark status, reminding you just how musically addictive records can be. Facilities and voicing are spot on, making it as versatile in use as it is in terms of partnering products, a genuinely high‑end unit that doesn’t look down its nose at less exotic or eclectic brands, instead elevating them to its own level. I got excellent results with Arcam and (take a deep breath) Naim amps, showing just how musically amenable the 120 really is. But the best bit is that it looks like a Zanden, it sounds like a Zanden and now, maybe a few more of us can actually afford to own a Zanden.